I don't know much about Zinopolis. I tried finding more information, but information on this wine is really sparse. And I guess that's fine. It's the wine, itself, that really matters here. So, let's get to it. 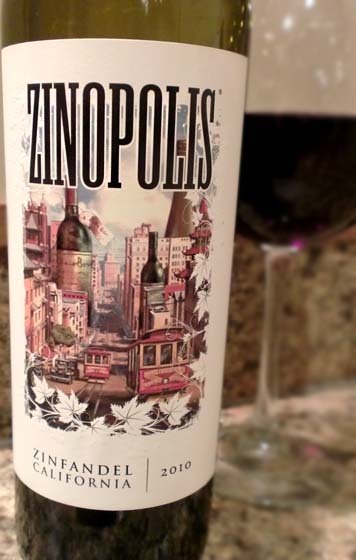 The 2010 Zinopolis Zinfandel pours a deep violet color and has bold aromas of red raspberry jam, cherries and vanilla. This leads into pretty much what the nose suggested: a heavy, jammy blend of spiced raspberries, cherry jelly, milk chocolate, vibrant oak, and a finish that's a bit like vanilla extract. All in all, a pretty typical California Zinfandel, jammy, boozy, and oaky. I really like how spicy this one is, which seems to counteract and balance out a bit of the heavy jam flavors and keep the party interesting. Drink This: if you want a good, sweet California Zinfandel for under $20. Don't Drink This: if you like your reds gentle and refined.